There are all sorts of myths and legends swirling around Halloween, which been a specially commemorated time of year for hundreds of years. Find out more with our seven spooky Halloween facts, which lift the lid on this much-anticipated holiday. One: Halloween originated in Ireland, from the pagan Celtic Samhain festival. It was believed that at this time of year the boundaries between the human world and the otherworld were less stable. For this reason, people would build bonfires and wear masks so as to confuse any of the dark spirits that they may have chanced upon. 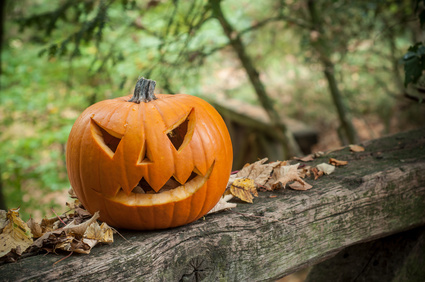 Two: People spend more money on Halloween than any other holiday outside of Christmas. According to a 2016 National Retail Federation study, Americans spend a total of $5 billion on Halloween celebrations each year. Britons spent £310 million on Halloween in 2016. Three: It is estimated that over $350 million is spent on costumes for pets every Halloween, with around 27 million people in the US regularly dressing up their pets for the holiday. Pumpkins, hot dogs and bumblebees are particularly popular choices, according to the National Retail Federation. Four: Originally people carved jack o’ lanterns out of turnips, not pumpkins. The legend originated in Ireland, where pumpkins were not available, and as emigrants travelled to the States they brought the custom with them, adapting it to the more commonly available pumpkin in America. Five: ‘Trick or Treating’ dates back to the 16th century in Britain and Ireland, when the poor would perform songs or dances door-to-door in the hope of receiving food or drinks. The modern version where children go around houses looking for candy gained popularity in the US in the 1920s. The majority of kids surveyed prefer to receive chocolate sweets rather than candy not featuring chocolate. Six: The word ‘witch’ comes from the old English word ‘wicce’, meaning wise woman. Witches were said to meet on Halloween night every year. In medieval Europe people believed that owls were witches, which is how the bird has become associated with Halloween. Seven: Some Halloween traditions include: wearing your clothes inside out and walking backwards, so that you will see a witch; hanging wet sheets over the fire to see an image of your future husband; if you spot a spider on Halloween it means a deceased loved one is watching over you; and seeing bats flying in or close to your house is a sign that ghosts are nearby. If you have started to get into the Halloween spirt already, then you may like to try your luck with our Halloween Scratch game. You can win up to £250,000 instantly, which would certainly be something worth celebrating this Halloween!